We are a diversified society, with all probability catering to every possible religion existing on this planet. This’s a good thing and we should cherish that we are somewhat tolerant to every sentiment and variety of views, which are both personal and religious. Equate that with few other so called developed or even underdeveloped nations and you will see how far we are superior in terms of our day-to-day behavior and approach towards things which might hurt individuals, a group or even a community. People from that side may vehemently disagree on the existence of any discrimination based on cast, creed or religion but it is no secret that it exists there. May be little but for sure it does and we have enough proof to verify that. Now go through the first and second sentence of this post again. When it comes to sentiments, it is more of a mutual respect for each other’s feelings. No government or law frameworks can teach people to be compassionate about what the other person might be feeling about a certain thing. This should come from within. Humanity and compassion is something which even the textbooks would fail to teach anyone. And compassion comes from many things that we do in our daily lives. Starting from the way we talk to the way we drive on our roads, it only reflects the depth to which we care for our fellow citizens. Our interest, disinterest, hobbies, political views and even our food habit are kind of parameters which showcases our approach in considering someone else’s opinions before we voyage out for anything. For harmony to exist we need all to adhere to few basics when it comes to acknowledging someone else’s feelings. But does this in real sense happen in India? I mean, cutting across religions, do we see people reciprocate each other in terms of their respective religious sentiments? I am told we are a secular nation, which unfortunately because of few morons has got a new meaning to itself. Now in India secularism necessarily means bashing of Hindus, their religious believes, their Gods and everything else that has got any relation with Hinduism; directly or indirectly. We randomly see pseudo intellectuals throw their five penny worth intellectualism at us in ridiculing one or other Hindu sentiments and runaway like crazy frogs. All these utterances then are conveniently gets wrapped under the secularism Teflon and delivered to us again and again by our hyper active media in an attempt to rub in the salt on our already toxic wounds. Latest one of such adventure is the national attempt at ridiculing Lord Ram. I am ok with my God having a criticism or two but just getting overboard in our criticism so much so to even use outright filthy language like loser, rascal and many such is about the line where it starts to hurt. Women like Priya Ramani (someone doesn’t possess something called enough brain to go beyond writing third grade Bollywood gossips) write pages on how she finds Lord Ram a loser. Not just that, she even tweets nonstop against Lord Ram with each of her Tweet containing a word or two against the Lord, which in milder terms can best be described as foul. Nobody questions her uncouth and uncivilized attempt in maligning our God. She still is protected from rebuttals and repugnance because as per few morons she has just done a very right thing on the larger interest of secularism. You know how Hindu bashing is directly related to Secularism in India. Insulting our God who is considered pillar of our religion and that too so openly and blatantly with such awful language is secularism? Where is the compassion here for what others have to say? Does idiots like Priya Ramani know, by their scrubbings they possibly would be hurting a lot of people beyond certain acceptable limit? But who cares since it is Hindu bashing after all, hence secularism. No? Perhaps Priya Ramani must try at a similar endeavor about Prophet Mohammad to help us get the answer in clear terms. Today I got to read this in Bangalore Mirror. The headline itself speaks a lot about the content that follows. “Draconian cattle protection rules back in guise”. Draconian? Really? I urge the features editor, if Bangalore mirror has one to reconsider the words he/she uses in the tabloid and that too on the front page. If a simple bill which is meant to protect our cattle (remember India lives in villages and to realize how important cattle are in those parts of India, you don't necessarily need to possess a Nobel laureate's acumen) is termed as draconian, then what about our land accusation bill? What about our primary anti-terrorism law POTA? Or for that matter even our domestic violence act? But hell, we can still call the bill draconian and never be questioned because it suits best to make the headline appear extremely secular. Here are few excerpts of the bill and my guess if it is actually draconian or not is as good as anyone else’s. As per the bill, it has got restrictions in terms of the manner and avenues available at our disposal before we can consume cattle as our food. Mind it, it never stops or restricts anyone to consume various animals (read cattle) as food, unlike many buggers would suggest it actually does. It only outlines a guideline for all of us to follow before we kill those animals for food. Do you see any harm there? On the bigger interest, shouldn’t there be such rules and frameworks? What is the bigger interest you may ask? I will answer that with a question. Show me one such developed nation where there doesn’t exist similar rules to protect the cattle so that rampant killing for food could be curtailed. And why it should be curtailed? Otherwise an unbound and uncontrolled killing has got impact on agricultural production and the GDP thereof in future. Let’s not even get started on the adverse impact that we will have on our milk produces if we allow uncontrolled slaughter. And how precariously we lack to meet our milk consumption demand is no more a secrete. But here in India who really cares for the GDP or any such nonsense? For us it is all about secularism, err.. pseudo-secularism that matters. Accompanying the article contained a photo with a small kid holding a placard that reads – ‘My Food, My Right’. Heavens, who disputed that right? And when? Does this bill infringe into that basic right of yours? Did this bill in anyway stops you from having the food of your choice? I agree, this bill prohibits cattle, more specifically Cows, which were once used for milk production from being butchered in their old days for food. Forget about any religion here and think – an animal which might have served you for decades with her milk; you might have seen your own kids growing up with that nutritious drink because of that poor animal suddenly becomes so disposable an object since she can’t reproduce anymore? Just because she can’t fulfill her basic utilization anymore, she automatically becomes an object to be killed and consumed? To hell with your bloody food habit; where is the humanity here guys? Where is the compassion for a speechless animal who has served you for so long? Have you ever cared to look in her eyes to see the unspoken pain that she would be going through when you finally decide to dispose her off to the slaughter house? How you can even think of any such end to that poor animal, which itself is a grossly deplorable thought process to begin with. You keep on shouting about your rights as if an animal doesn’t have any. Who gave you the bloody right to kill an innocent animal and that too after enjoying its service for decades? This is the real motto of the clause in the bill. To engender some humanity in you, if you have long forgotten that you guys are humans. Why give religious angle to the rule without an ounce of understanding of the bill, which Bangalore mirror tried it’s best to do? What else one can say the reason for BM to use the line ‘BJP in power’ many times in the post? May I just drop a question here? What BJP has got to do with the Cattle protection bill? The bill is not passed by BJP but the union cabinet in accordance with our constitution and it is only the state that is duly implementing the rules. Rather being questioning other states which are chickening out in implementing this rule of the land we are questioning the state which in fact is doing what an elected government should do. Why? Where the state government gone wrong in here that you have started accusing the party in power of biased approach? I agree BJP might be using the bill to protect cow slaughter since cow is considered a sacred animal for Hindus as the cow is not just an animal for majority Hindu households but a bunch of sentiments. Even then, do you see any wrong there if at all the real motive of BJP is to protect a primary Hindu interest? As I said earlier, shouldn’t we be considerate of each other’s sentiments if we really want to call ourselves a harmonious society? When killing cows really hurts the sentiments of Hindus so badly, can’t we refrain ourselves from doing that? Or Hindus being the majority doesn’t deserve to carry any sentiments as it might go against the secularism as per the morons I have addressed earlier? Can’t we produce beef from animals grown specifically for this purpose? Just like how we meet our chicken and mutton demands. But no, we would still cry foul for the nonexistent discrimination and accuse everyone of sabotaging the fundamental rights with our baseless allegations but can’t just be a little considerate of the sentiments of the other side. We would routinely expect the other side to reciprocate with kind when it comes to our sentiments while we never would do even a thousandth of it when it comes to pay back the favor. When there are avenues and ways where we can have options to both meet our food need as well as respecting some religious sentiments; we won't work towards that option but will remain hell-bent on insulting someone’s beliefs and cry foul for everything else. Perhaps, this is the outcome of this refurbished new kind of secularism – “We are aggrieved, you mend yourself; you are aggrieved, don’t look at us for change but mend yourself again”. Before I cape the post, how about a demand for pork to be served in every government establishment's canteen, mid-day meals in schools, college cafeterias and even on our Air-India flights which seldom fly? My Food, My Right…. No? So Correct. Humanity must supersede everything else. Because all religion's core ethos are nothing but humanity only. Regarding politics around issues pertaining to minorities and appeasement thereof; well no need to write any blogs on that. It is well understood and noted. Any way a great post as always. Keep that up Bro!! 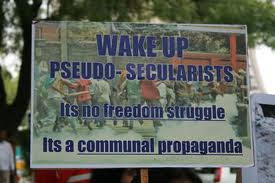 i would like to know what do u think is the definition of the word secularism?? i do not disagree with anything you have said here, i would just like to know in what context is this word used in this article.